Production Worker – I weld banner hems and fit the eyelets, I check over for quality issues and ensure your goods are in tip top condition before packing them. I also support the rest of the team elsewhere as required. Full City & Guilds Technicians Apprenticeship. 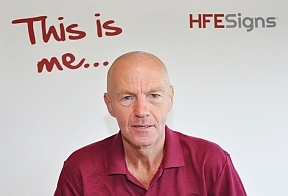 I have worked in the production industry for various large companies for most of my working life, I took early redundancy (Toyota, Derby) in 2004 and moved to Cyprus, I returned to the UK in July 2016 and joined HFE.